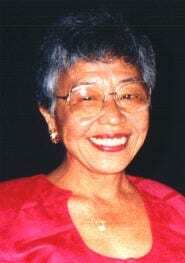 Professor Louise Imiko Okazaki Mullins, Shichidan, was the youngest daughter of Professor Henry Seishiro Okazaki. She began training at home with her sisters, Betty (Wolf) and Myrtle (Oberman). Their father taught them jujitsu techniques and under his direction established with them a foundation of massage through many hours of practice (head, hands, and feet) with him as the “patient.” He also entered the three of them in a women’s Jujitsu class instructed by Iwalani Tanaka and Jackie Wong. In the early sixties, Betty, Myrtle, and Professor Mullins were trained by Keiko Fukuda, the highest-ranked female judoka in the Kodokan. They continued teaching both Kodenkan and Kodokan techniques until the 1970s, when Professor Mullins retired for health reasons. Then, in 1993, because of Professor Clyde Zimmerman’s encouragement and support, Professor Mullins came out of retirement and returned teaching. In 1994, Professor Mullins was promoted to Godan and Professor, and was most recently ranked as a Shichidan, a 7th degree black belt, by the Shoshin Ryu Yudanshakai. Professor Mullins was a regular attendee at the AJJF conventions, as well as the gatherings of other Danzan Ryu organizations. Known as Imi to her many friends, Professor Mullins would light up any room she entered with her ear-to-ear smile and twinkling eyes. Though she may be gone, her smile and her spirit will continue to brighten the lives of those who knew and loved her.